Homepage Women Salwar Kameez Makes A Huge Comeback, Here’s How You Can Style It Right! Salwar Kameez Makes A Huge Comeback, Here’s How You Can Style It Right! Believe it or not, the trend of wearing salwar kameez is never out of style. Not only is this attire comfortable to the core, it is also an apt one for the dicey weather conditions. Be it a casual event or a formal one, it won’t let you down. Not only is this ensemble hassle-free, it is also fashionable these days thanks to the innumerable variations available. Salwar kameez is a spot-on choice for most women on almost all occasions. With a wide variety of patterns and styles available it is also necessary to check which one suits you. Though styling a salwar suit may seem simple it sure does involve loads of elements which have to be taken care of. Gone are the times when womens dresses only meant that one typical style. These days there are different styles of bottoms available. The on-going trends include anarkali dresses, angrakha salwar suit, jacket style, front-slit, high-low , etc. Anarkali dresses are the most opted attires for any occasion. The flare and the unique colour combinations make them a perfect fit for any event. They are comfortable to carry and also give you a rich look. 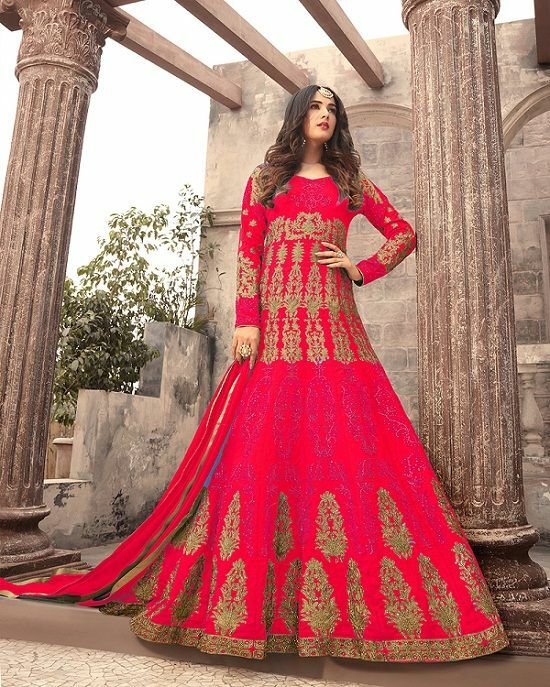 Low on complications and high on style, anarkali dresses are a must-have for anybody who loves wearing ethnic attires. If you are looking out for a dress which will add an oomph to your style then you should definitely opt for Angrakha dresses. The overlapping layers and the tassels give a twist to the boring kameez pattern. 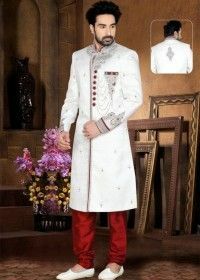 A jacket-style suit is the most recent trend in the world of Indian ethnic fashion. The stated consists of two layers i.e. the kameez and its jacket. A jacket-style suit adds a touch of newness to the mundane styles. 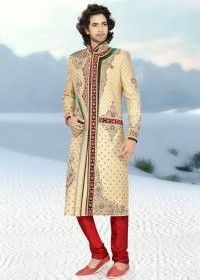 One can enhance this look by trying contrasting colour combinations on the jacket and the kameez. This outfit looks good when the event requires you to dress in an adorned manner. Slits are no longer restricted to western clothes; this trend has also become a rage in ethnic fashion. Front-slit salwar suits are elegant to the core and have a long slit starting from the mid-section. If you want to experiment a bit and want to try something new then front-slit style suits are the way to go. The high-low trend started off with kurtis in particular, however, this style has been adapted successfully in dresses too. The high-low salwar kameez suit plays with the length of the kameez giving it a unique feel! Along with the new patterns in tops, salwar has also undergone a drastic transformation. Bid goodbye to the loose fitted salwar and make way for trendy patterns, like palazzos, dhoti salwar, harem pants, parallel pants, etc. Palazzo pants are an amazing choice if you want to wear something trendy and breezy. Pair up these palazzo pants with kurtis or straight fit kameez and you are good to go. Moreover, palazzo pants come in almost every colour, so you are spoilt for choice! Though similar to the original salwar style, dhoti salwar is exactly like traditional dhotis. These bottoms have numerous pleats and are mostly ankle length. Combine a dhoti style with a plain kameez and you are definitely going to make a style statement. Harem pants are baggy with a slightly fitted ankle. These pants can be worn not only with a kameez but also with a plain top. These pants are a must-have for anyone who has a liking for loose clothes. Harem pants come in varied prints and colours. Additionally, one should opt for cotton fabric when it comes to harem pants. Straight fit parallel pants are very much in trend. These pants have no flared bottoms and are like formal pants. Parallels are an amazing choice but see to it that they suit your leg frame too. The kind of fabric you choose for your suit is also very important. Every fabric has its own quality and it will definitely affect the style. While cotton salwar kameez is commonly opted for, georgette, silk, and chiffon have now come in the forefront. While choosing a fabric one should first decide what pattern one wants because not every fabric is fit for every design. Cotton suits are generally printed with bold colours and different kinds of designs. Geometric, floral and bohemian prints are common ones when it comes to cotton salwar kameez. Perfect for regular wear, cotton suits are an amazing choice for summers. Go for a georgette salwar kameez if you want to wear something for a family event. If you opt for georgette you can opt for various kinds of embellishments and embroideries. Right from floral motifs to zari work, you can experiment with anything on a georgette fabric. Silk fabric has always been attached to richness and elegance. You can opt for block prints, hand embroidery, woven art etc on silk fabrics. There are many dress materials available in silk. These days in order to add exclusivity, women are also opting for Pashmina silk and Chanderi silk. If you love embellishments and stonework then chiffon dresses are the way to go. A perfect fit for important occasions and events, chiffons give you a good fit because of their quality of being lightweight. Moreover, the softness of chiffon will intensify the work done. Along with the stated factors, selecting the right dupatta with your salwar kameez is also important. Dupattas come in various fabrics and works, in order to look prim and proper, you need to invest your fashion sense in the right dupatta too. Rather than matching your dupatta with your dress, it is much advisable to go for a contrast one. Chanderis are very much in these days for they are perfect for experimentation. Team up your pop-hued chanderi dupatta with a simple dress and you are bound to look graceful. Who says cotton dresses are not glamorous? Every fashion enthusiast who likes wearing Indian attires should invest in an Ikat dupatta. They have peppy colours and bold prints which are perfect for almost every suit. Gota Patti dupattas are laced or have delicate designs in silver and gold. They sometimes also contain shimmery laces and ribbons in the tones of gold and silver. If you are a no shimmer person but still want your outfit to have an added essence, then Gota Patti dupattas are for you. Bold prints, block printing and quirky designs are the aspects of Kalamkari dupattas. They have freehand designs and bold dark colours. Team this up with a not so patterned salwar kameez and you are ready with a new look! When it comes to Indian dresses accessories are of great importance. Apart from the staple earrings, neckpieces and bangles there are many other ways to accessorize your attire. Nose rings are back in trend with many celebrities opting for it! These days there are varieties of nose rings available. Right from nose studs to naths you can transform your look by all means with this accessory. You can also shop for nose rings online! When you wear an Indian attire, you can also dress up your ankles with a delicate anklet. An anklet will give your look an enigmatic feel. Ring bracelets do justice to almost every ensemble. Elegant ring bracelets which are simple with minimal embellishments are perfect for any occasion. Other than the stated, you can also experiment with necklaces and earring by trying new styles. Instead of wearing the age-old neck pieces one can opt for a choker. Ditch your regular earrings and choose from the variety of drop earrings. Though various designer patterns are available, there are various factors one must consider before buying one for a specific event. Here are the factors you need to take into consideration before finalising your outfit. Go forward with a dark-hued heavily flared anarkali for a winter event, however, you surely should take care of the fabrics when it comes to Indian dresses. Cottons are perfect for summers, while you can try out georgette and silk for winters. Party wear salwar suits must be worn keeping the time of day in mind. If it’s a day event it is always advisable to go for lighter shades or brighter tones. One can readily opt for darker hues like maroon, black, dark blue, dark purple, etc. for evenings. Don’t go overboard with your dress with too many elements. If the event is a small function wherein you can also do with a classy cotton dress, team it up with appropriate dupatta. 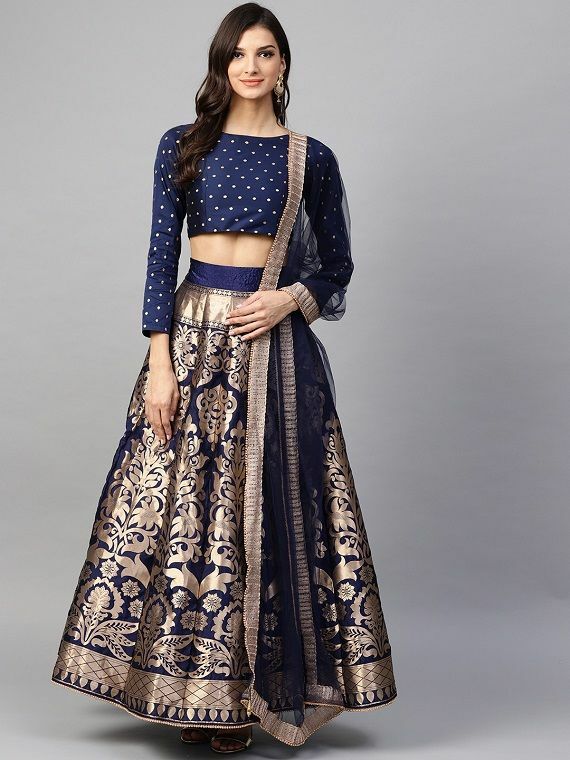 For family functions, you can go for a heavy-laden front slit salwar kameez or a floor length anarkali dress while casual salwar kameez can be donned for everyday use. With traditional dresses, you can try out various colour combinations. Be it the combo of a dark and a light colour or be it the different shades of the same hue, you can pair up various tones. Here are some colour co-ordinations which will upgrade your style! Pale blue and baby pink is a very light toned combination. Mostly all salwar suit attires come in dark hues but this combo is perfect for a day outing. Additionally, it will also break the monotony in your wardrobe. Shades of brown are rarely chosen by many for ethnic ensembles. However, if you pair up the tan shade with Maroon you are in for a unique dress altogether. This combo is tricky to carry but if it is done smartly you can definitely stand out! Beige and red make for an exceptional combo. You can team up your beige salwar kameez with an electric red dupatta and look stunning. Make sure your red dupatta has some engaging motifs or patterns! 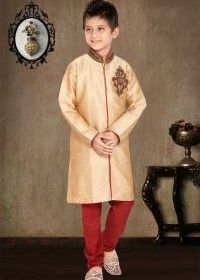 If you want to look extremely classy and traditional at an event make sure you have the tone of gold in your salwar kameez. Though red is the colour people mostly opt for when they have to attend a wedding function, you can twist your style and opt for a dark green shade. Rust orange has become a personal favourite of many. The colour is apt not only for a day event but is also perfect for an evening function. Pairing up a rust ensemble with a white embellished dupatta makes for an alluring combo. Where to get your perfect salwar kameez? It is easy to shop for salwar kameez online as well as offline. Most of the stores dealing in ethnic wear have a varied collection. 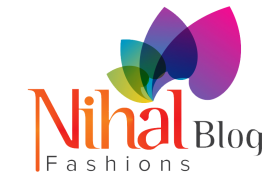 However, if you are looking out for an extraordinary outfit then you must check out Nihal Fashions. 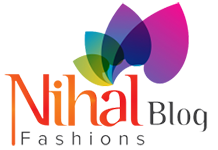 Head to Nihal Fashions for all your traditional wear needs!